Hello my fellow Jeepers! What is the best exhaust system for Jeep Wrangler YJ? Well, that depends are you wanting a new stock replacement exhaust or a high performance system to get more power and better fuel mileage? There are so many choices is can be confusing and overwhelming! I have been in the game of building cars, trucks, motorcycles and Jeeps for just over 30 years. So, I have seen many types and brands of exhaust systems and individual exhaust components such as headers, catalytic convertors, mufflers and exhaust pipe. Some I liked .. Some I loved .. Some I wouldn't put on a lawnmower!! What is the best exhaust can be a matter of opinion. Some people like Flowmaster, some like Dynomax or Borla and so many others. Then there is the Jeep owners who prefer having a stock replacement system under their rig. Then there is the exhaust header. Some want a factory replacement, some people like the high performance stainless steel headers. Again .. it's a matter of personal taste. One thing is for sure. No matter what brand we like, we want quality parts that last! So, with that being said, I have brought together a list of the best exhaust systems for your Jeep YJ. You pick your favorite brand! Most people don't purchase a complete kit from header to tail pipe. They usually replace a header, muffler or catalytic converter individually because they typically wear out faster than the the exhaust pipe. So, I'll save you a little time and start out the list as components. The exhaust header or manifold is the #1 source for exhaust leaks for the Wrangler YJ and XJ Cherokee. Most all the factory manifolds eventually crack right where the primary tubes meet the collector. Sometimes the leak is so subtle you don't really notice it over the sound of the engine running. Other times it crack bad enough that it has that whistling popping sound all the time. So annoying! The Wrangler YJ engines were either the 2.5 liter 4 cylinder or the 4.0 liter 6 cylinder. The early YJs 1990 and older had 4.2 liter as the 6 cylinder option. I'm going to create the list for each engine. If you order from the Amazon link please verify that it fits your particular model. If you opt for one of the performance headers, expect better performance, better fuel mileage and really cool exhaust notes! If you wanted a direct factory replacement, here is what you would get. The little cast iron 4 cylinder exhaust manifolds are way less prone to cracking. But occasionally the original factory cast iron may crack. It's typically due to uneven torquing of the bolts with the heat expansion. So, if you use this manifold to repair your Jeep, do yourself a favor and make sure all your manifold bolts are torqued exactly the same. Click here for current Amazon pricing. Be sure to order a new gasket. The gasket for the 2.5 and 4.0 seal the exhaust and the intake manifold to the cylinder head. Click here current Amazon pricing. This design is my favorite for the 4 cylinder YJ. Its got the long primary tubes which helps build low end torque. The little 4 cylinder 2.5 needs all the help it can get in that area. Once you get the RPMs built up the larger primary tubes and larger collector will help on the top end as well! It has mandrel bent 1-1/2" primary tubes and 2-1/2" collector all TIG welded together for solid strength. Of the headers I'm going to list for the 2.5 liter 4 cylinder Jeep Wrangler YJ, the MVP would be the one I'd choose hands down! Click here for the current Amazon price. This tube design is no doubt way better than the factory manifold design. Longer primary tubes merging in one common place within the collector helps pull the exhaust gases out of the neighboring cylinders. This will help produce more torque than the factory short primary factory manifold. Made of mandrel bent Stainless steel with 1-1/2" primaries dumping into a 2-1/2" collector will be a great improvement over the stock manifold. This would be a great header to replace a stock manifold. Click here to check Amazon for current pricing. *** Please note: If you are buying this header because it looks cool and shiny. When it gets hot, then there will be blue and purple places where the heat turned the stainless finish. It doesn't hurt the strength or performance of the exhaust header. It just creates pretty little blue and purple areas. That is typical for polished stainless though. For the Jeep Wrangler YJ, the 4.0 liter inline 6 cylinder is the most popular of the 3 engines mentioned above. The tough, reliable and super durable 6 cylinder came on the Wrangler YJ scene in 1991. This was the first fuel injected 6 cylinder engine. It has the most simplistic injection system of any vehicle I've ever worked on. The 4.0 Jeep engine is my favorite inline 6 cylinder ever made. 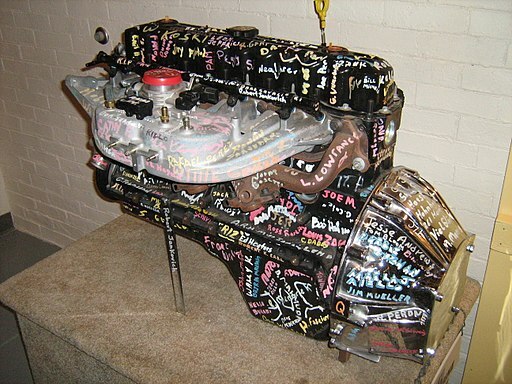 The engine picture with signatures all over it is the 5 millionth 4.0 liter engine made. Nope .. that's not a typo .. that is 5,000,000+ 4.0 liter engines made!! Unlike the 2.5 liter 4 cylinder, there are lots of choices of exhaust manifolds and headers for the 4.0 liter inline 6. Building the best exhaust system for your Jeep Wrangler YJ, you gotta start with the exhaust manifold for stock replacement or header if you are going for the performance. Now the modding gear head that I am I wanna start with the performance stuff first. Alas, I'll do this in logical order. With 95%+ of the factory exhaust manifolds cracking, many aftermarket manufactures are addressing this issue by putting flex points within the long primary tubes. This is supposed to help take some of the vibrations away from where the primary tubes are welded to the collector. If you look at the Amazon picture link of the manifold kit you can see the flex joints in the long primaries. Click here to see the current price of the Jeep Wrangler exhaust manifold. It makes total sense that the flex joints would work simply because long section of anything structural has more leverage and movement than any short spans of the same structural material. *** Just a quick side note .. I work in the IT field for a living now. Before IT I worked in the product engineering field for over 12 years. Structural loading tests was part of what I did at the time. Yep .. I got to design stuff, then break stuff and got PAID FOR IT! Sweet! Since at a very young childhood age I've been addicted to cars, trucks, Jeeps and motorcycles. This manifold is the same design as above except this one is made of stainless steel tubing. Stainless is not prone to rusting out than standard DOM tubing. Even though the Amazon title calls this a header. I disagree because if it's tubing intersection design. Look how the short primaries dump into the long primaries. In my opinion it still doesn't transition into the long primaries at the proper angle for proper exhaust scavenging. Yes, its a better angle than the one above, still not enough for me to call it a header. I personally would not go with this manifold, although its not gonna rust out anytime soon! So, it would make a good "stock style" replacement with an upgrade in metal. Click here for current Amazon pricing. Yeaaaa .. I get to write about performance exhaust parts now! I love modding stuff for more power. That is exactly why my YouTube channel is called Power Addicts. OK .. get back on track! Now we are at the the performance exhaust headers for the Jeep Wrangler 4.0 liter. I'm gonna list a few different options. Some exit like the factory exhaust manifold .. some are nothing like the factory unit. With anything performance oriented there is always the possibility of having to do a little or a lot fabrication work. Above all else, I'm not gonna BS you!! The first header on the line up according to the Amazon listing is a direct bolt in for many different models. Its made if T-304 stainless tubing. Notice there are no short tubes dumping into long ones. That's a good thing because it really helps the scavenging effect of pulling the exhaust gases out of the cylinders. By helping with airflow that increases horsepower and torque. Which can in turn help with fuel mileage. Every Jeep Wrangler can use help with that!! According to the specs the header fits 1991-1999 Jeep Wrangler YJ and TJ with the 4.0 liter inline 6. Also 1991-1999 XJ Cherokees and Grands. With its 1-1/2 primaries dumping into 1-5/8 larger tubes finally all merging into a 2-1/4" collector. This is a header I would be happy to try out. It is not expensive at all either. Click here for Amazons current price. This header from Spec-D Tuning has a great design of the 6 primaries being joined as 2 then dumping into the collector. Like the others, that is what makes a header NOT a manifold. The primaries are of similar length, not some of them being short stubs dumping into another primary. This exhaust header has a bit smaller collector than some of the others with its 2" outlet. Depending on the down pipe you are using that can be a good thing or bad. Meaning, if you still have the factory sized exhaust pipe, it should mate up to the header collector just fine. Click here for Amazons current price. For exhaust pipe like on my daily driver '91 YJ that is 2-1/2" diameter. I had to down size my pipe right at the collector to make it fit properly. Now, keep in mind that YJs didn't come with exhaust pipe that size from the factory. When I do my next engine swap I will be upgrading the header as well to a much larger primary and collector size. Engines have to breath to perform efficiently! *** Please note, if you are purchasing this header because its polished and shiny. The polished stainless will turn blue and purple in places because of the heat produced by the super hot exhaust gases. That just what polished stainless steel does under intense heat. Here we go .. getting into parts that give even better performance, better fuel mileage and longer life. Banks products is largely know for their turbo charger upgrades for the full size diesel truck crowd. Their manifold and turbo upgrades have been the industry leader for producing INSANE amounts of torque for the full size truck in-line 6s. Reviews all around the internet states that the performance gains from this 4.0 exhaust header is totally worth the bit higher price tag! With the power Banks extracts from the big 6's, it just makes sense that they can do the same for the Jeep inline 6's as well. These headers have TIG welded 4090 Stainless Steel and 1/2" thick flanges to ensure durability. Even though the price is higher that the ones above, it is well worth the money! How much is it? Click here to check Amazon for current pricing. 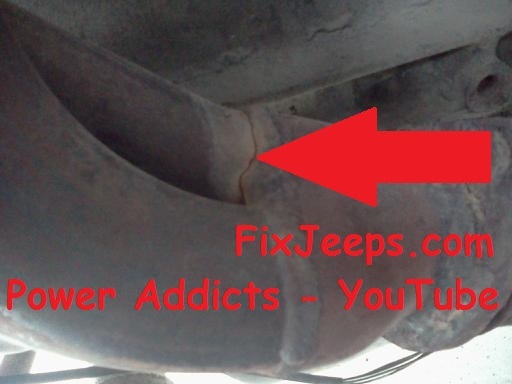 OK .. this is what some people claim .. the Best exhaust header for a Jeep Wrangler YJ. It is way more expensive than the rest. All across the internet it gets great reviews. I personally like the way the primary tubes goes into the Y-pipe. Makes for a great scavenging header for better performance and mileage over a factory style manifold. Stainless steel for no rust issues, then the Ceramic coating adds to the protection. I personally haven't seen this header after long term use. I have seen the Ceramic coating on some headers start flaking after a while. These being high dollar JBAs .. I would hope they wouldn't flake off! Click here to check Amazon for the current pricing. When talking exhaust components for Jeep Wrangler YJs, the topic of mufflers is the most common part discussed among forums and online Jeep groups. Rightfully so, there are so many brands, materials and even internal designs of the muffler. I'm personally running an old 40 series Flowmaster under my 4.0 YJ. Not really because that is what I prefer, I just had it laying around from an old Bronco I stripped out. For a stock naturally aspirated 4.0L Jeep 6 cylinder, I'd be more likely to pick a muffler base on sound more than thinking that it is going to make a huge difference in performance. Don't get me wrong when I say that. Any performance muffler is going to be better than the stock one. Its just that the street driven 4.0 produces most of its power down low in the RPM band. Rock crawling is low RPMs as well. So, tons of air flow really isn't required. Now .. if you slap a turbo or supercharger on it .. thats a totally different ball game. Then you need to make sure the exhaust flows as best as possible. Lets start out with what would be pretty much the stock replacement. This will be one of the "Quiet" mufflers. Walker is a great muffler, many of the exhaust shops local to me use this muffler. This Walker exhaust muffler is made of aluminized steel for corrosion resistance. Only real down side, this muffler not being stainless and being on the lesser end of the cost spectrum. It will be made of thinner gauge metal. It will eventually rust out. If you want a low cost replacement muffler, this one will work for ya. Click here to check current pricing on Amazon. A next step upgrade from the above muffler. Still gonna be a "Quiet" muffler yet made from a quality stainless steel for up to 3x the life expectancy. Yes this muffler is 3x the cost. So, it would really depend on whether you are planning on keeping your rig or fixing it up for resale. The picture shows a tail pipe comes with it. After reading through the comments and questions, the tailpipe does NOT come with the muffler. Click here to check current pricing on Amazon. Me personally, Dynomax is my favorite muffler for performance. Flow tests and dyno tests have proven that Dynomax mufflers outflow everyones favorite Flowmasters. Even at a lesser price point. This model Dynomax has the rolled edges, whereas my favorite model of Dynomax are the welded series. I ran these on my Mustang GT 5.0 and a 1967 Mustang Coupe I used to own. They have a nice deep rumble at idle. Getting it the throttle the RPMs get up there they have a sharper higher pitch snap. Dynomax even gives limited lifetime warranty. Click here for current prices on Amazon. I gotta admit, I do love the sound of Flowmasters. For a Jeep Wrangler YJ, this is probably what I would run if the rig is naturally asperated. Slap a supercharger on the YJ, I might stay with the Flowmaster. Supercharges unlike a turbocharger do not depend on the exhaust flow to drive the compressor. OK, not i'm gonna stir up a crap storm. If I went turbocharged, the Flowmasters would have to go. Turbochargers depend on the exhaust gas flow to spool up the compressor side for boost. Because Flowmasters have "Island" style baffles to make the sound collide into its self to reduce the "loudness". Those baffles cause turbulence inside the muffler. Turbulence restricts airflow .. period. For non-boost applications, Flowmasters are SWEET! Love the sound and they have no fiberglass packing inside to blow out. Click here for current pricing on Amazon. Do you have performance mods on your 91-96 YJ?. You could definitely use a larger exhaust system. This JBA system uses 2-1/2" diameter pipe where as the factory exhaust uses 2-1/4". The muffler is a straight through perforated pipe design. You WILL get air flow with this kit! I'm running 2-1/2" exhaust from manifold back on my 4.0 YJ. It sounds great at idle with its slight rumble to it. This JBA exhaust kit is made from stainless steel. So it will be long term investment for ya 'cause its gonna last you while! It also comes with a nice polished exhaust tip to put icing on the cake! You really cant go wrong with this kit. You may need an adapter to go from the factory 2-1/4" exhaust to the 2-1/2" kit. That can be purchased at any autoparts store. Click here to check on current pricing from Amazon. If you want a stock replacement kit, this will work for your Wrangler YJ. I really thought about not adding it because it is (at the time of this writing) more expensive than the JBA kit above. Some people "just have to have" stock replacement parts. So, I'll add it in for them. Click here for current pricing on Amazon. If you are joining exhaust components together, they need a way to stay together. That way will be either welding or clamping. I can weld exhaust components together no problem. I prefer to use these band clamps because if you ever need to lower your exhaust they make life WAY easier. Many people use the old school "muffler clamps", you know the bent bolt going through a saddle looking thing. Problem with those is they dent the pipe so bad you cant pull it apart if you need to lower your exhaust for transmission work or something. The band clamps do not crush the pipe making exhaust disassembly much easier if needed. Click here for a selection of different band clamps. I hope this list of parts help you build the best exhaust system for Jeep Wrangler. I'll update as I find more parts to add to this article.